She cut her hair short 'because it annoyed me'. Everyone cut off their hair in imitation. This is probably the most concretely bustable myth about Chanel. It is very popular, appearing frequently in fashion blogs. Even when academic writers acknowledge that she did not invent the style, she is given top billing and the bulk of the credit for popularizing such a daring innovation. The main strike against it is that the date of her bob is given as 1916 or 1917 (one blog calls this "long before the look became popular", which will be refuted in a minute). As was demonstrated in Part II, Chanel was successful but not the über-popular figure until later in the 1920s, and it would be difficult for her to have such a widespread effect midway through the 1910s or early in the 1920s. The next time I heard the call of the scissors was just before I was going into the hospital to be operated on for appendicitis. I never liked having anyone comb my hair, so, to assure as little combing as possible, I cut it all off. I say all; it never fell much below my shoulders. In 1915, references to the Castle Bob (either as an actual haircut or as a sort of hairpiece) and its popularity among young and old started to pop up, and they proliferated in 1916. Whether or not Chanel had the star power to make the bob at this time, it was consistently attributed to Irene Castle and it was regarded as popular before Chanel was supposed to have cut her own hair. Chanel's own account of the bob was apt to change. She first stated that she shortened it bit by bit because, as Nicholson quoted, it annoyed her; later, the story was that a sudden gas burner explosion dirtied her hair and her reaction was to chop it off as her maid begged her to stop. It's impossible to determine which story is true, but it must be acknowledged that one is certainly more theatrical and interesting than the other, and that Chanel is known to have invented myths about herself to suit her personal and business needs. 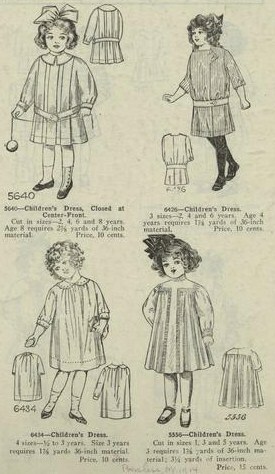 In addition, young girls of the 1910s commonly wore their hair short. They also wore waistless and dropped-waist dresses, which would become as common as the bob in the 1920s, and it's quite possible that these elements' transition from children's dress to fashionable dress are related. Lastly, I would like to note that in 1931 Chanel told a reporter from the New York Times that "long hair would be coming back into general fashion soon. If a few smart women wear their hair long the rest will follow." She was aware that hair length was a fashion choice, rather than a reliable indicator of independence or modernity.